1 cup of pumpkin – I always have some in the fridge as it is such a versatile vegetable so cook a cup or so. 5. Cook polenta as per packet instructions, making sure to stir in parmesan. This photo is half a cup of polenta. 6. Cut a piece of baking paper & put on a flat surface (a plate or chopping board). 7. Spread the polenta quickly & quite thin on the baking paper (polenta is quite dense so the dish is too heavy if not spread thin), then too w pumpkin, parsley, chilli or whatever toppings you like. 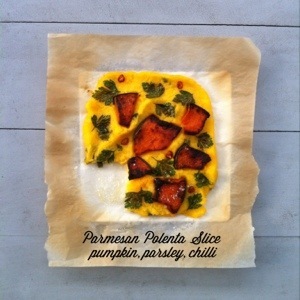 This entry was posted in Recipe and tagged chilli, iqs, parmesan, parsley, polenta, pumpkin, vegetarian by 6 Clean Ingredients. Bookmark the permalink. Polenta is such a great gluten-free alternative and I wish I had it more often!! I’m going to make pumpkin & parmesan polenta ‘chips’ next….